From the experience and the research by Saretto Pappalardo, here are several reflections on sugar and its usage in artistic works and more. 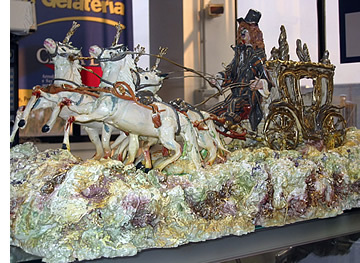 Coming from Sicily Saretto Pappalardo is a pioneer of sugar and research in general. Besides being a serious professional and a fine demonstrator, for years he's been testing, producing and utilizing new kinds of sugar and marzipan in his laboratory-workshop in Misterbianco (Catania), where he works with his sons Carmelo, Alessandro, and Piero. 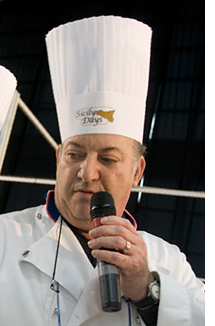 What follows are some questions asked to Pappalardo during an enjoyable chat, in which he talks about Isomalt and sugar in general. He shows why every professional must understand the products he uses every day, by studying their characteristics, also from a scientific point of view. Mr Pappalardo, what do you think of Isomalt? It's a sugar substitute and I've been studying it for some time, even if it was banned in Italy twenty years ago. These days I find every artistic sugar work to be quite similar and this is also Isomalt fault, because it's a product that needs to be analyzed and “understood”. What do you mean by "understood"? Isomalt must be coupled, just like the industry does, because it can't reach the correct lucidity and elasticity on its own. Furthermore one needs to know how to cook it, because often you get your fingers burned, while there are instead products that make the temperature go down, therefore incr easing the glossiness. In fact, just by adding water the product becomes lime-like, because the molecules break while cooking (at 160°C), i.e. it caramelizes and so it tends to break and lose glossiness. So what must it be coupled with? With sorbitol while being cooked: it is dry and anhydrous, it lacks water. Isomalt can also be coupled with polydextrose, even if it’s more expensive, because it's a crystallization glucose. By joining two molecules you obtain more brilliant results, by making the art job easier, without adding water, which often causes the works to break - especially during transfers - and leads to opacity after just few days. What do you think about its usage in ice cream making? There are already Isomalto-based, already prepared product lines on sale. Personally I advise against manipulating it by yourself, because of the risk of causing bad imbalance, which can make ice cream too hard and particularly laxative. To avoid such serious problems, the companies producing the bases supply already balanced glycerol, to add at boiling point, this way binding the water, so that ice cream remains softer. 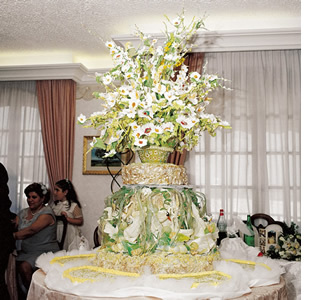 Isomalt is a substitute of sugar, the only one obtained from beet sugar. Through a two-phase process, the components of sugar - glucose and fructose - re-join with the insertion of natural enzymes and the enrichment of hydrogen. This causes the formation of a new substance, similar in many ways to sugar, of which it has the same taste and look, substituting it by a ratio of 1:1 and providing bot h the mass and the texture. Like sugar, it is a carbohydrate rather than a chemical synthetic product like no-calories sweeteners. Through modifications on the chemical structure, Isomalt shows several dietetic and technological characteristics, which spread its usage to new physiological conditions and particular technical needs, such as increased stability and heat resistance. According to research on both normal and diabetic subjects, Isomalto etermines negligible increases of glycaemia and insulin and a low amount of calories, about 2 calories per gram rather than 4. Furthermore, it doesn't foster tooth decay. Its hygroscopic power is low, thereby guaranteeing less alterations caused by humidity, and it's resistant to zymotic hydrolysis, which means less sub-layers at the advantage of bacteria, therefore the impossibility of its growth.